Patients who choose Invisalign to straighten their teeth have a lot to look forward to. This orthodontic option can improve the alignment of your bite without the need for visible metal brackets and wires. Plus, it allows you to live life pretty much the way you are used to. Care for Invisalign properly and you will speed through the treatment and be enjoying your new smile before you know it! Read more about the Dos and Don’ts of Invisalign below. When you receive your Invisalign treatment, your dentist will give you careful instructions about how to care for your aligners and your smile throughout the process. Follow these directions closely to avoid any delays in treatment! DO remove your aligners to eat and drink anything besides water. DO wear your aligners for 20 to 22 hours each day. DO rinse your aligners after taking them out and before putting them back in. DO brush and floss your teeth thoroughly to remove any leftover food particles after each meal and before reinserting the aligners. DO visit your dentist for regularly scheduled appointments. DO laugh, speak, and smile with confidence throughout the treatment thanks to clear Invisalign aligners! 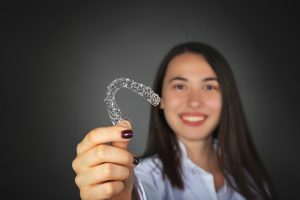 Be sure to avoid these Invisalign mistakes, which can end up costing you time and money on your quest for straighter, more attractive teeth. DON’T drink highly pigmented beverages while wearing your aligners — this can stain the plastic and leave your teeth at a higher risk of discoloring as well. DON’T expose the aligners to warm or hot water, as this can cause them to warp or lose their shape and delay treatment. DON’T brush your Invisalign trays with regular toothpaste or a hard bristled brush, which can scratch the delicate plastic. DON’T wrap your aligners in a napkin while you eat — many are lost forever this way! DON’T take your aligners out for more than an hour or two at a time for special events, as they should always be in your mouth for 20 to 22 hours each day. DON’T hesitate to get in touch with your dentist for questions or anytime you think something does not feel right. And last but not least, don’t forget that undergoing the Invisalign treatment is a great way to enjoy healthier, happier teeth. If you are interested in learning more about this treatment or need to go over the instructions for use once more, get in touch with your dentist to discuss the treatment this month. You deserve a beautiful smile! Kraft & Schrott Dental Associates offer patients straighter teeth with Invisalign in Boston. If you have crowded, gapped, or crooked teeth but do not wish to wear braces for a year or more, don’t hesitate to call your dentist and set up an appointment to discuss Invisalign. They can be reached by phone at (617) 227-4924.